Ella's Bubbles takes pride in helping senior citizens achieve the dream of enjoying their golden years in their own home. Walk-in bathtubs allow people of all ages and mobility levels to enter the bathtub through a hinged door with a very short step. More than any other age group, seniors enjoy and benefit from the relaxing and restorative properties of hot baths, but traditional bathtubs pose a major hazard for people with limited mobility. Bathroom falls are a leading cause of hospitalization among the elderly. Walk-in bathtubs allow people of all ages and mobility levels to enter the bathtub through a hinged door with a very short step. Thresholds can be as low as 3.5 inches (when the drain is installed below the subfloor), compared to over twenty inches on a standard tub. This difference vastly reduces reliance on balance and range of motion to prevent injury - physical capacities that decline with age. Other safety features of Ella's Bubbles walk-in tubs include strategically-placed grab bars and slip-resistant floors. A Thermostatic Control Valve (TCV) regulates the flow of hot water to prevent temperatures from becoming scalding or harmful. The TCV arrives set to 100.4 degrees but can be adjusted to suit your preferences. Our accessible walk-in bathtubs come in a variety of sizes and configurations, including two-seater tubs for companion bathing. Companionship and the buddy system is not to be underestimated as a safety precaution. If one companion becomes incapacitated, the other can render aid or summon emergency services. Looking out for one another’s best interests doesn’t go away as we age, and neither does the enjoyment of a couple’s bath. The gravity-driven two-inch dual drain empties water from the walk-in tub quickly, so you don’t have to wait long to get out of the bath. With no electronic parts to malfunction, the dual-drain system empties the tub up to 260% faster than a standard drain (depending on the existing plumbing conditions of your home). Other optional features include heated seats and backrests, which do wonders for back pain. Additionally Chromatherapy, Aromatherapy, and Ozone Sterilization attachments are other popular features. Hydro-massage and air-massage jets are available as well in multiple configurations. Our accessible walk-in bathtubs also come optionally equipped with patented Infusion™ MicroBubble Therapy. This breakthrough technology pumps up to 50% more oxygen into the water in the form of microscopic bubbles, which burst against the skin in millions of tiny impacts. Studies have indicated the capacity of these bubble bursts to tone, soften, hydrate, cleans, and smooth the skin, undoing some of the tolls of ageing. 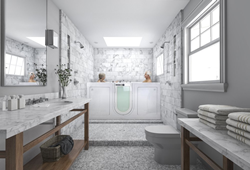 In addition to an Ella Walk-In Bathtub, reconfiguring other parts of the bathroom is essential in making sure mom and dad can age in their home. Consider adding grab bars around the toilet. Installing a medical alert or phone within easy reach in the bathroom, especially for seniors living independently. Door locks should be operable from both sides, in case emergency service providers need to enter. Ensure that working fire extinguishers and smoke detectors are on every floor, and that slippery floor waxes are not used in the bathroom. Using only non-glare incandescent bulbs of 100 watts or higher can also prevent injuries. By considering minor changes like these, senior citizens can age in their own home with confidence. To discuss safety and accessibility renovations with an authorized reseller or installation expert, call Ella's Bubbles at 800-480-6850 or contact us online.